← How Safe is Your Organic Chicken? The relandscaping of a favorite. The April 2013 cover of Garden Design magazine. Photo courtesy of Garden Design. 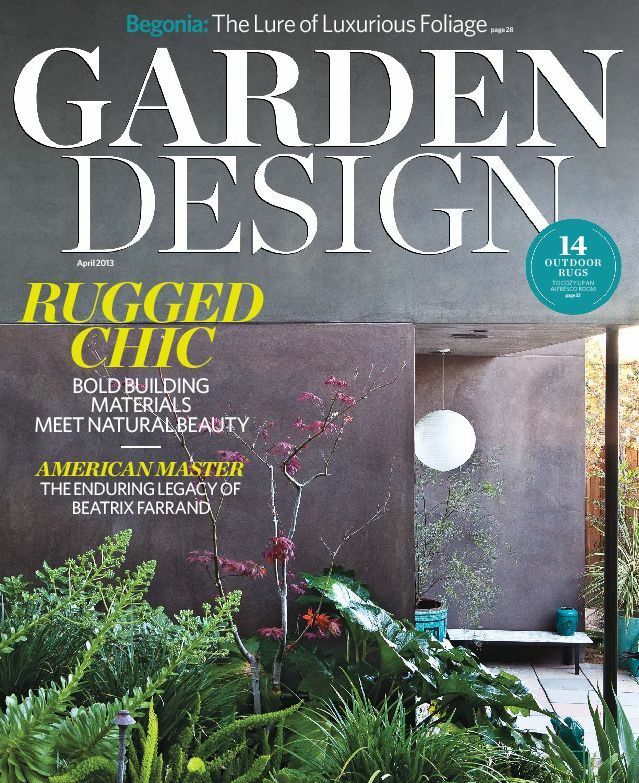 Garden Design, the beloved cutting-edge bimonthly magazine that ceased publication last year, plans to start the presses again. When Garden Design shuttered last spring, yet another casualty of the economic slump and publishing world’s digital shift, readers mourned the loss a coveted magazine that celebrated the American garden lifestyle quite unlike any other. Now, under new ownership with Khara Dizmon, former editor-in-chief of Landscaping Network, at the helm, the magazine is being resurrected as a quarterly this summer. What can you expect? An inspirational, visually rich and coffee-table-worthy showcase of beautifully designed public and private spaces with ideas for your own garden and informative articles in a thicker 132-page package. We can hardly wait. If you’d like to be notified when the new Garden Design launches, and to get a twice-monthly gardening and outdoor fix, you can subscribe to their free e-mail newsletter by clicking here. This entry was posted in Garden Decor, Garden Design, Gardening, Landscaping, Outdoor Decor, Uncategorized and tagged garden, garden decor, garden design, gardening, Khara Dizmon, Landscaping Network, lanscaping, magazine, outdoor spaces. Bookmark the permalink. I am glad to see Garden Design returning, but I hope it will learn a bit from its past mistakes. I remember last year reading several discussions theorizing on its demise, and many of the comments echoed the same thing: It had become too predictable and too focused on California gardens and style. While the gardens profiled were always lovely and the magazine was intended to be aspirational, that sameness limited its appeal to gardeners in non-Mediterranean climates. Surely there’s plenty of exciting design work being done all around the country; I hope to see it when the magazine relaunches this summer. Thanks for the update! Now I know why my subscription seemed to suddenly cease. It will be nice to have them back and I agree with the previous commenter that I would hope for more variety in the gardens they choose to show us all. As an East Coaster, I felt that we were left out in the cold. Wonder if they will actually offer any issues to their old subscribers who were left without the rest of their paid subscription? Hmmm…according to their Web site, subscribers should have received issues of Organic Gardening magazine for their remaining portion of their subscription. Well, guess what…I must have fallen through the cracks. Nor do I recall any communicaiton from them about discontinuing the magazine. Glad it will be back though. Fine Gardening is the magazine is you want to actually learn about gardening but Garden Design was a great complement – to look at new and exciting plants as well as to see gardens depicted with terrific photography. We read all the blog posts before we purchased Garden Design and there were two major things to address: more diversity across the country with coverage; and more accessible products. Thanks everyone for their insights. We are updating gardendesign.com 4 times per week and Facebook is growing by thousands of fans per week. Join the conversation there too! btw- The first issue will be in garden stores nationwide June 1st.